There are some who believe that eating beans on New Year’s Day can bring you good fortune for the year ahead. Beans are said to represent coins. I can’t promise you will win the lottery this year, but I do know that this soup is really good for you and it tastes really good! I had a leftover ham bone from Christmas Eve dinner and used that, but you don’t need a ham bone to make this. You don’t even have to add any ham, but if you want that flavor, you can use a few slices of bacon or cube up some thickly sliced pieces of ham from the deli counter. I used dried beans in this recipe, but skip that step if you’d like and use a combination of your favorite canned beans. Just rinse and drain them really well before adding them to the soup. In a large pot, combine the beans and the water and bring to a boil over high heat. Boil for 5 minutes, then shut the heat off and allow to sit for one hour. Meanwhile, in another large pot, sauté the onion, celery, carrot and the herbs (tie the herbs in a bundle with some twine). After a few minutes, when the onions are softened, add the garlic and sauté for a minute or two. Add the ham bone and cook a few minutes longer. Add the water and some salt and pepper and bring to a boil. Once boiling, lower the heat and simmer for one hour or more. Once the beans have sat and have softened, drain and rinse them very well in a sieve under cold water and allow them to sit. Remove the ham bone from the pot and the herb bundle and discard. Add the beans and kale into the pot and simmer for about 30 minutes. Remove from the heat and add more salt and pepper, if it needs it. Then add the parsley and top with some freshly grated Parmesan for serving. When preparing the beans to soften, do not use any salt at all. Salt will make the skins of the beans very tough and unpalatable. If you are not a fan of kale, you can use spinach in its place. Just made this tonight and it was a huge hit with my family. We are big fans of kale, so the bright green made it look prettier too. I also diced up a thin ham steak and added that to the broth, warm french bread and yummo! I probably wouldn’t add salt to the broth next time as the ham salted it up enough. Otherwise, awesome recipe! I’m so happy to hear everyone liked this Michelle! I love that you diced up the ham. I can see where it would add some extra salt. If you have any soup left, you can try adding small amounts of water just to dilute that saltiness. Thanks so much for taking the time to comment! You’re so sweet! I just made this and my beans are still a bit chewy. Should I have soaked them more than an hour? The package said to soak them overnight. I’m new to using dried beans, so I need all the help I can get! Thank you! Hi Mrs. Knielsen…I’m not sure if different brands have different cooking times. 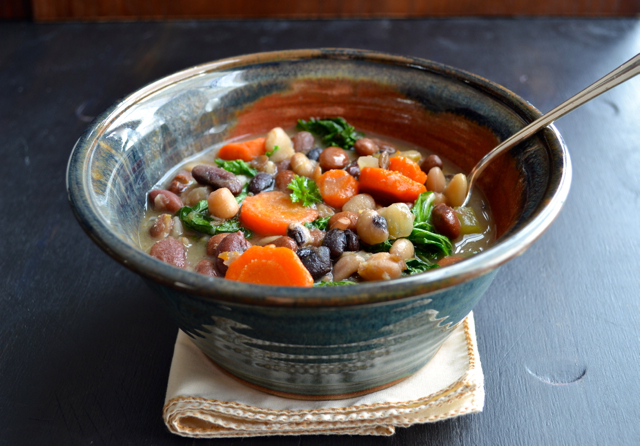 The beans I use do have the overnight method, but also this quick one that I like. If you’d like the beans more tender, just simmer the soup a bit longer and they should be perfect. I simmer them for about 30 minutes in the soup. Increase that time to an hour and let me know how that works out for you! I hope you love it! I don’t have any fresh bay, thyme, or sage…will dried versions suffice? And if so, how much? Dried herbs are fine. You can use one dried bay leaf, 1/2 t. dried thyme and 1/4 t. dried sage. If you don’t have those on hand, you could even substitute the three herbs for 3/4 t. – 1 t. of poultry seasoning. It’s a mixture of herbs that have some of the same flavors. Hope this helps. Thanks for stopping by and hope you like the soup! This is an amazing soup! The only thing I did differently was replace 2 cups of water with vegetable broth and not put in the ham bone (I’m vegetarian). Such a great soup to have on a cold day after the holidays. Such a great idea Julie! I will try it that way next time I make it. I’m so glad you liked the soup! Thanks for taking the time to let me know. I love hearing from people who’ve tried my recipes…you’ve made my day! Is the ham bone really necessary? Can I just use some vegetable stock in its place? The ham bone is not necessary at all. It does add a lot of flavor, but if you want to keep it vegan, it would still be delicious with vegetable stock. When keeping things vegan, I usually add a bit more of the things that add to flavor, in this case, the herbs, onion, celery and garlic. Enjoy and thanks so much for stopping by…let me know how it works out! Thanks Hilary! It really is healthy. 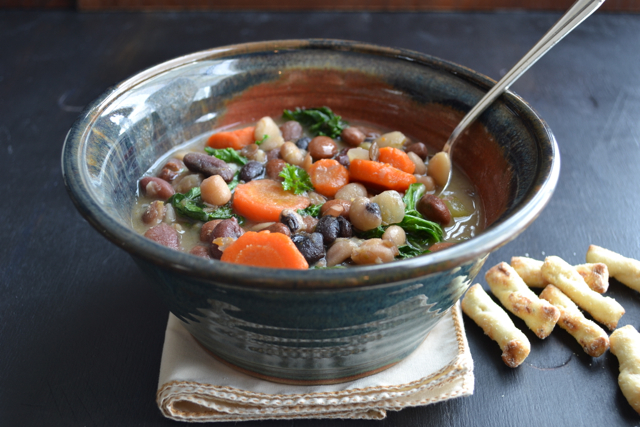 I love beans and this is so hearty and filling. Thanks for taking the time to write! sounds delish! Gonna tryyyyyyy iiiiitttttit! Thanks so much! I’m so glad you think so. Let me know how you like it!